Experience some of the most stunning and breath-taking scenery on this amazing 13 night fly drive holiday. Depart the UK on your chosen scheduled flight to Las Vegas. Upon arrival, collect your Alamo Gold rental car and proceed to your hotel. Las Vegas is the entertainment capital of the world, so even after a long journey you will be drawn to experience this amazing City. After dark the incredible themed hotels, with their multitude of neon lights, create a unique atmosphere that has to be seen to be believed. From the city of entertainment to the awe inspiring Grand Canyon which has to be rated as one of the most spectacular sights in the world. En route, take time to stop and take a tour of the Hoover Dam, on the Nevada/Arizona border. When you arrive at the canyon the remainder of the afternoon is yours to enjoy either a hike into the Canyon or perhaps to take an aerial flight for a bird’s eye view. 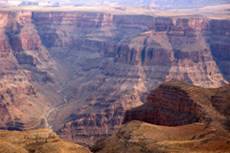 A leisurely morning at the Grand Canyon is followed by the short drive to Lake Powell. Enjoy two nights at the Lake Powell Resort overlooking the man-made lake, which was created when the Glenn Canyon Dam was built in 1966. Don’t miss taking the boat trip out to Rainbow Bridge, the tallest natural bridge in the world. Some of the best scenery in the southwest can be viewed on the journey to Moab, so take some time to enjoy it. Three nights in Moab will give you the opportunity to explore Utah’s majestic scenery and perhaps take a drive down to Canyonlands and Arches National Parks. There’s a wide range of recreational choices including hiking, rafting, boating, four wheel drive tours and scenic air flights. Named for the enormous rock ridge that runs for more than 150 km through it, Capitol Reef is a very peaceful and tranquil National Park, with several hiking trails and scenic drives winding through it. Today’s short drive brings you to spectacular Bryce Canyon. 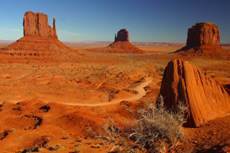 Here you can see some of the earth’s most colourful rocks, sculpted by erosion into pillars and spires. You may choose to leave your car and take a hike along one of the many loop trails down into the Canyon and walk among the colourful stone monuments. You can enjoy a wide range of activities here from horse riding to hiking to quad biking. Time for some last minute shopping or sightseeing before making your way back to Las Vegas McCarran Airport to return your hire car and check in for your flight back to the UK sure in the knowledge that the Canyons will be calling you back.